Assistants Under Training, commonly known as AUTs are students of premier engineering and management institutes who choose to pursue their careers with ITC, straight after they graduate from their institution. AUTs are inducted into the ITC system with the objective of nurturing and grooming them to be the leaders of tomorrow. From the day an AUT joins ITC, the Company ensures that necessary inputs are provided in terms of managerial development, cross functional and cross business exposure and indepth functional exposure in order to develop domain expertise, to equip them with the knowledge and skills required to perform their roles, as well as to lay the foundation for their growth and development as business leaders. AUTs undergo training for a period of one year after which they are confirmed as Assistant Managers. AUTs, after they join ITC, are taken through a one-week corporate induction programme wherein various Business Heads introduce them to their businesses. The induction programme is also aimed at facilitating a smooth transition from campus to the corporate world as well as to provide an opportunity to interact with business leaders. On the whole the programme aims at giving an AUT an understanding of what defines ITC, how ITC works and the lives ITC touches!!! Once AUTs join their respective businesses, they go through a division and function specific detailed induction programme which provides them a thorough overview of the business model of the division, introduces them to various functions within the business and gives them an extensively detailed insight into their own function. The induction programme is supported by projects and stints which help grasp the various nuances of the business and at the same time contribute to the growth of the Company. ITC recruits from premier management campuses across the country for its Marketing, Human Resources, Supply Chain and EHS functions. 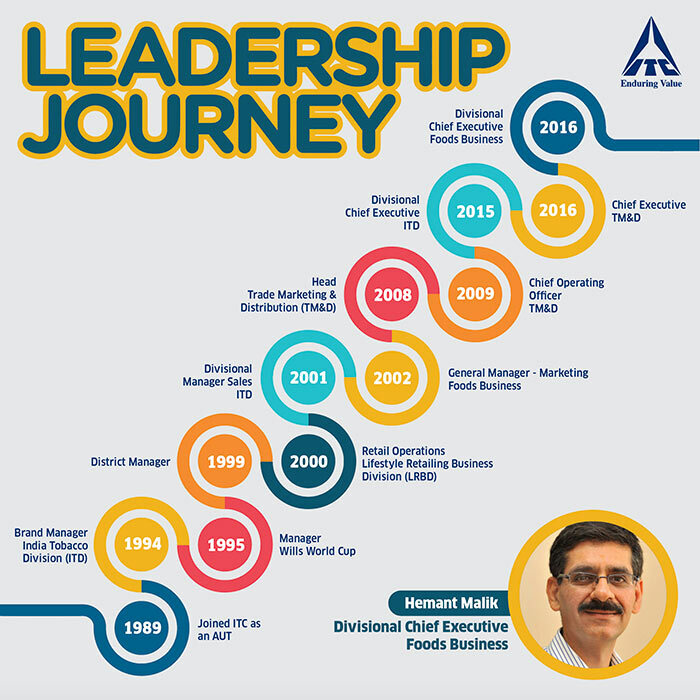 The diversity in ITC's businesses, superior brand building capabilities, unmatched supply chain, experience in working in new and established businesses added to the large employee base and operations spread across the length and breadth of the country offer management AUTs a unique and unparalleled experience. Budding Engineers from IITs, select NITs join ITC and a world of latest technology, state of the art machines is thrown open to them. With 18 factories spread over the country ranging from Paper and Paperboards to Foods to Cigarettes, ITC is beyond doubt an engineer's paradise. Responsibilities begin early with exposure to projects, production planning, product quality, product development, tracking financials, state of the art machines, people leadership making ITC one of the most challenging, rewarding and enriching experience. Interested students from premier campuses are invited to apply online. An ideal candidate aspiring to pursue a career with ITC must possess the right mix of academic achievements and co-curricular excellence. We look for students who are able to think creatively, work in teams, convert adversities into opportunities and lead through ambiguous situations. Candidates must have demonstrated leadership across various spheres of student life. As our operations are spread across cities and rural settings we prefer candidates who are open to the idea of working in locations which could be remote and culturally distinct from their own. The students shortlisted through the application screening are invited to participate in an online assessment. The assessment is non-technical and non-aptitude in nature. Candidates shortlisted through the online assessment are invited to participate in a group activity. This activity provides us insights into the candidate's ability to lead, influence, communicate and work as a member of a team to achieve the desired results, all essential for a successful manager and emerging leader. Candidates selected through the group activity are invited to a personal interaction with some of ITC's senior managers. This provides us the opportunity to understand the candidate's depth of function knowledge, general awareness and the overall fit with our core values, besides gaining a better understanding of the candidate's background and attributes such as leadership, teamwork and the ability to succeed. Each step presents us a unique opportunity to get to know you better, and we look forward to seeing you in your campus!! A post-graduate in Human Resource Management from SCMHRD Pune, my journey in ITC started in 2003 as a KITES summer intern in ITC's Lifestyle Retailing Business Division. After a successful internship I joined the Company in 2004 as an AUT (Assistant Under Training) and kick started a new and exciting chapter in my life, which continues to remain an integral part of me and my family. I believe that integrating work and life, is a very important aspect and is also the hardest to achieve, especially for women. While we experience many personal milestones of marriage, managing households and having children and so on, I feel privileged to say that my organisation and my seniors have supported me in preserving this balance beautifully. It is with a sense of pride that I tell others, "I work for ITC". An opportunity to experience multiple roles across its many diverse businesses and my journey in the organisation is a testament to it. Beginning with the sales stint which was part of a well-structured cross functional AUT induction programme to recruiting and training field sales executives in the FMCG businesses to implementing new IT Systems and talent management interventions in the Lifestyle Retailing Business Division and today I am hiring Expatriates for ITC Hotels! 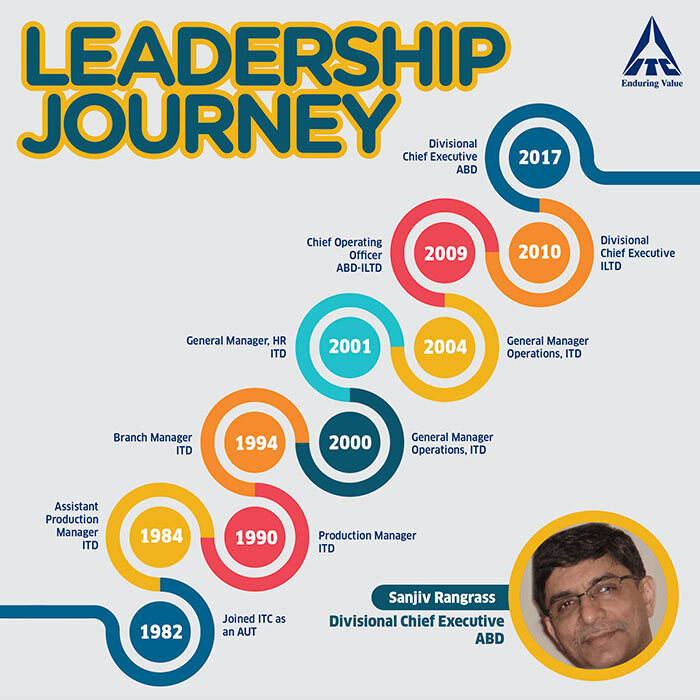 Throughout my tenure in the organisation, my seniors and the Heads of my function have entrusted me with roles that have a direct impact on the organisation's success. Transitioning from college lectures and assignments to "real life" and project deadlines can be a daunting challenge. I embarked on this journey a year ago. Wow, what a learning experience it has been! I am now positioned at the Head Office, Kolkata as Asst. Manager, Operations. What is expected of me is a fresh insight on things, which is often appreciated. I have learnt to work hard and work smart! ITC is fast paced, challenging, and a whole lot of fun - a place where I am growing not only professionally but intellectually, where my ideas are accepted and challenged as well. Our work culture recognizes and respects people with diverse perspectives and skillsets.It is an organisation which genuinely cares for employees and involves people in decisions that affect their jobs or work environment and we have a rocking party scene too! I am attracted to ITC because of the ongoing challenges that this company offers as well as its expectation for high performance.The biggest thing I've learnt here is to always push your ideas further if you really believe in them... they could turn into reality! I joined ITC in June 2012 as an AUT in the HR function from Tata Institute of Social Sciences, Mumbai. 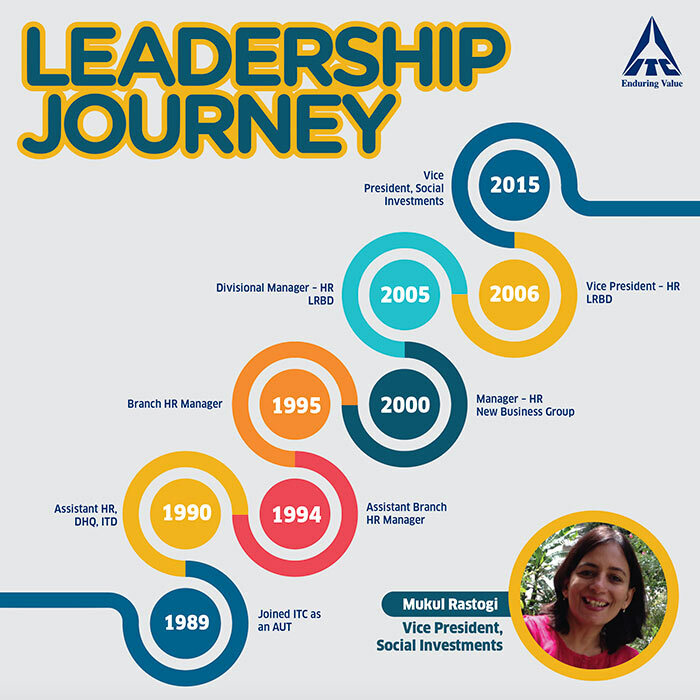 Having made it to my dream company, I looked forward to an enriching and exciting experience at ITC, and here I am a few months into the journey, living the excitement each day! The journey began with the Corporate Induction Programme in Kolkata. The induction programme provided us with an in-depth introduction to ITC, the organisation and its various businesses. It was a great experience learning about the organisation from the very stalwarts who played a pivotal role in building it and listening to them share stimulating stories about ITC's 100 year journey of transformation, the culture and values of the company. Another highlight was meeting young managers like ourselves in the best venue possible (ITC Sonar). The induction turned out to be one of the most inspiring preview into the world of ITC. My journey in ITC could not have started on a better note! My first stint in ITC was with the Bangalore Cigarette factory. Two months of core operations induction helped me develop a deep appreciation of the true legacy of manufacturing excellence that ITC has built over a hundred years. After rigorous training and an even more grueling review, I moved on to a cross functional stint with ITC's Trade Marketing & Distribution vertical at its Kolkata Branch. Nothing could prepare me for the exhilarating experience that lay ahead. Be it accompanying the salesmen on their daily beat and selling ITC products across a plethora of portfolios, learning the nuances of sales & distribution, performance management systems etc. The stint provided me with a whole new perspective to the organisation and the learning was immense. I then had an HR stint at ITC's Saharanpur factory, where I am posted currently. From studying Industrial Relations in college to actually practicing it each day, challenges of engaging the workforce, working on diverse projects, learning the various HR systems and processes, my current role has given me the best possible learning that I could have asked for as an HR professional, in a short span of four months. I was also appointed as the Campus Ambassador for TISS which not only gave me insights into the campus recruitment process but also provided me with opportunities to connect with aspiring candidates, liaise with my campus and share my experiences with my organisation as well as my alma mater. 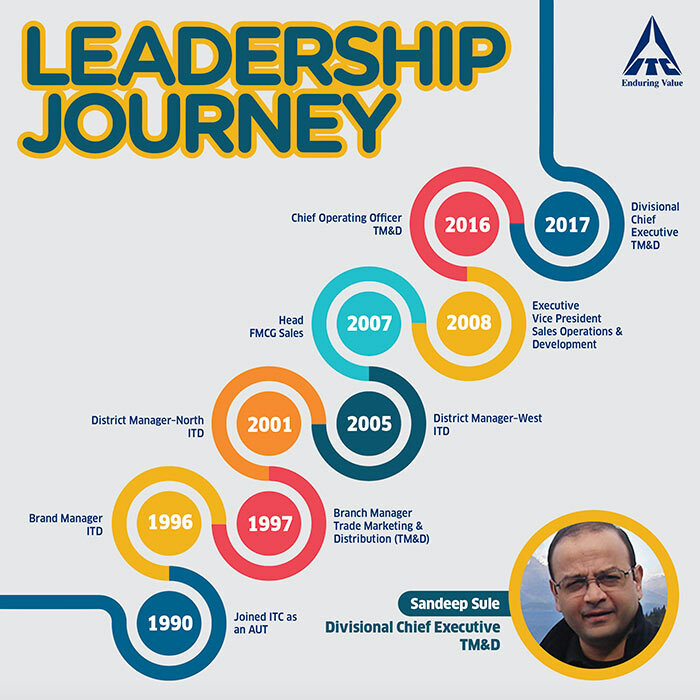 ITC is a place where leaders are built and one will witness this while interacting with many senior managers who started their careers with ITC. Here, new ideas are not only welcome but are expected from young managers. As a company, ITC has created a balance between short term goals and results whilst focusing on long term sustainability, thus setting high expectations for everyone who works here. A variety of projects, exposure to various businesses, abundance of knowledge & wisdom and great time with colleagues - ITC is a place where you constantly learn, stay excited to deliver and build relationships for a life time. As an HR professional, ITC offers you challenges across diverse business contexts, helping you continuously hone your skills and to develop as a true professional. I majored in Economics followed by a Business Management degree. I was always inclined towards working in the FMCG industry in a country like India because it is a microcosm reflective of the changes taking place in the world in terms of rising incomes, changing demographics, etc. thereby offering a constant learning curve. After spending two months in ITC as a summer trainee, I realised that this was where I belonged. 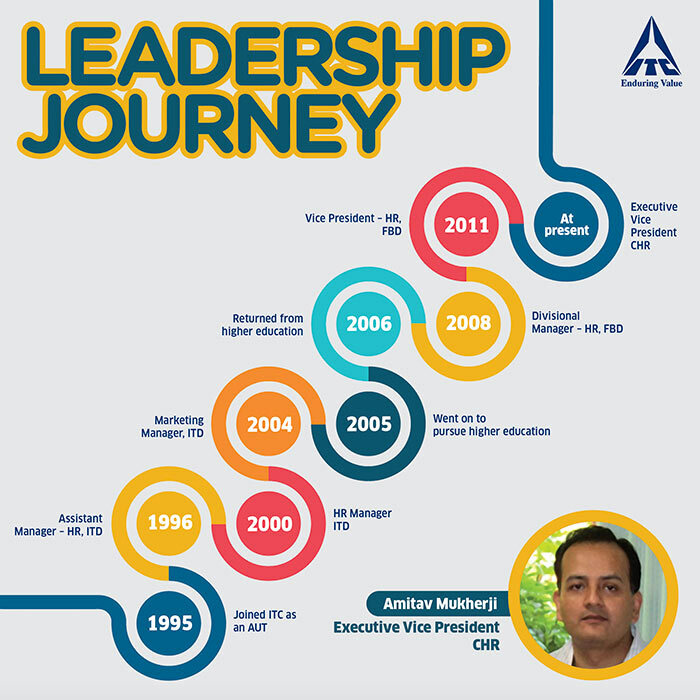 Having worked for a year before my MBA, I was taken in by the warm camaraderie and sheer energy of ITC. The office was bursting with energy with everyone raring to go, helping each other, talking loudly as if they were still in college. I realised that these are things I look for in a workplace. I started with a training stint in Kerala which was a huge transition since I neither knew the language nor understood the culture, but honestly, I couldn't have asked for more. I learnt by doing and that's how one learns best, and that's how ITC operates. The DNA of ITC is such that it focuses extensively on training and each team is expected to spend time working through and understanding the roles of his/her team members. Involving the trainee in various non-core activities develops in him a deeper understanding of company culture. Post training, I was moved to a Head Office role. The role was in sharp contrast to my previous assignment and required me to develop new skills. More importantly, the scope of my work was significantly enlarged to include development of industry best practices for our front-end distribution network. I am looking forward to my next assignment and the change itself provides a great learning opportunity. ITC is a place where you can make mistakes and people will encourage you for trying. It is a place that abounds in energy, filled with people who are brilliant at what they do but always wanting to learn more. It is a place where no one will stop you from asking questions. Most importantly, though, ITC is a family, where you laugh and cry with the people you work with because they are the best friends you will ever make. ITC has provided me in-depth training in the area of sales & distribution with a specific focus on systems & processes for measuring performance. 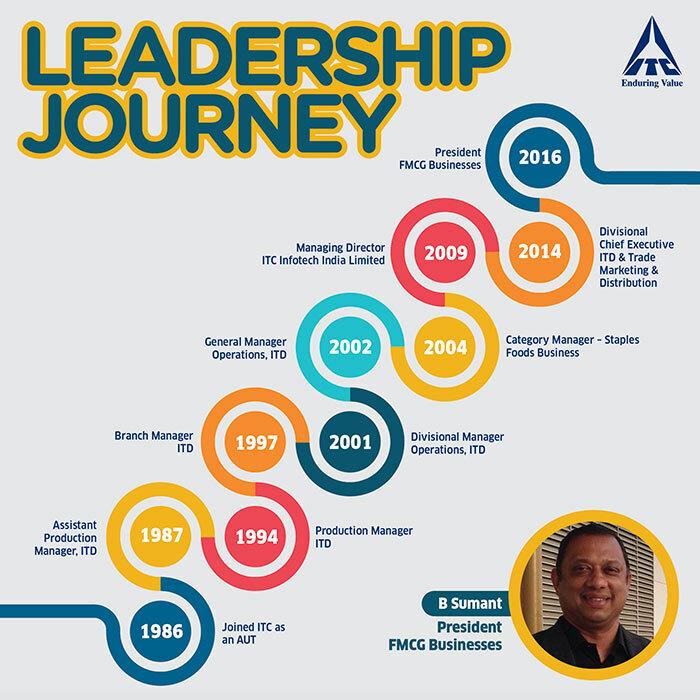 The diverse roles profiles during these two years have enabled me to develop a wide perspective on various aspects. Also, my constant involvement in various task forces has developed in me a wider appreciation of various functions & roles in the Company. By providing me with a Head Office experience in the early stages of my career, ITC has given me an incredible opportunity to interact with senior management at close quarters. This has further added to my skill-set in terms of a inculcating in me a long-term perspective, an opportunity to learn from the experience of the very best and a deeper understanding of the culture and expectations of the Company. A Campus Ambassador is an alumnus from your institute who acts as your connect with ITC, as we say the one point contact. Any questions relating to ITC right from the company structure, operations, brands, products, to organising guest lectures, information about placement process to knowing what it is like once you join ITC, you are free to contact your Campus Ambassador.